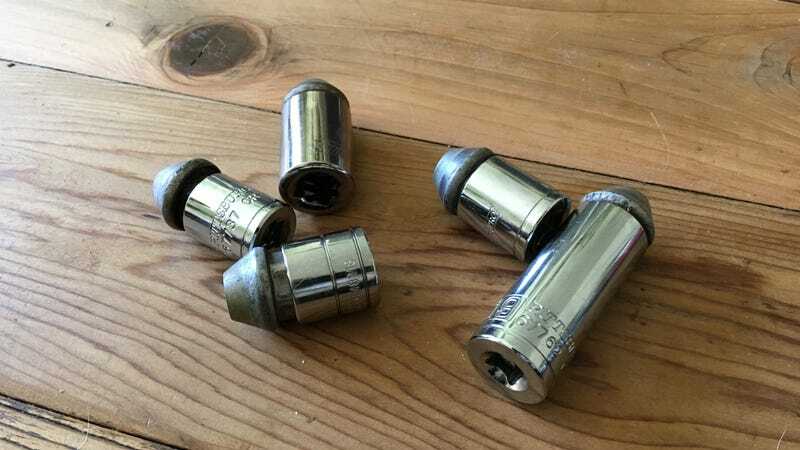 These are all the sockets that ended up stuck to lug nuts in the course of rotating my tires. I deeply appreciate their service, both in removing the wheels and giving me a decent excuse to pick up a torch soon. All shiny and not broken! While I was up front, I noticed that a lot of the body clips in the center lower part of the bumper, holding in the lower grille piece, weren’t inserted properly, so I fixed all of those up to lower the drag coefficient by a tiny, tiny amount. I’m glad I have this all over with! With the wheels rotated and the new fog light in, that wraps up the things I wanted to take care of ASAP. The new highest priority is the AUX port, which I’ll post about later in the week (spoiler: I won’t be using a kit). Other than that, the only things I’m planning to do right now are change the oil and get new tires some time before the Oppo cruise.